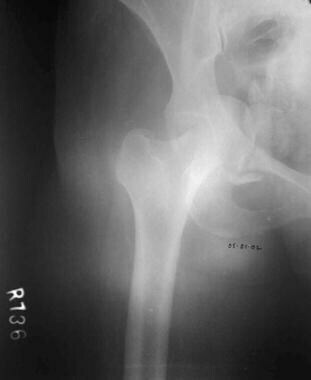 Fractures of the acetabulum occur primarily in young adults as a result of high-velocity trauma (eg, vehicular accidents or falls from heights). These fractures are often associated with other life-threatening injuries. Displacement of the fracture fragments leads to articular incongruity of the hip joint that results in abnormal pressure distribution on the articular cartilage surface. 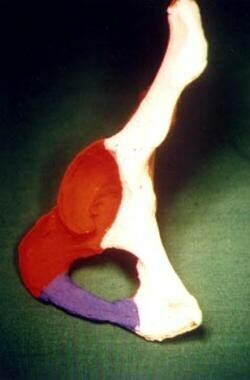 This can lead to rapid breakdown of the cartilage surface, resulting in disabling arthritis of the hip joint. Anatomic reduction and stable fixation of the fracture, such that the femoral head is concentrically reduced under an adequate portion of the weightbearing dome of the acetabulum, is the treatment goal in these difficult fractures. With advances in imaging technologies, performing acetabular fracture surgery through smaller incisions is now possible. In the future, computer-assisted surgery may contribute to the operative management of these injuries, as well. The acetabulum is formed by a portion of the innominate bone. It lies at the point where the ilium, ischium, and pubis are joined by the triradiate cartilage, which later fuses to form the innominate bone. The acetabulum is enclosed by the anterior and the posterior columns like the two limbs of an inverted Y (see the images below). Columns of the acetabulum, anteroposterior view. The white area is the anterior column, the red area is the posterior column, and the purple area is the tie beam (inferior pubic ramus). Columns of the acetabulum, iliac view. Columns of the acetabulum, obturator view. The anterior column comprises the anterior border of the iliac wing, the entire pelvic brim, the anterior wall of the acetabulum, and the superior pubic ramus. The posterior column makes up the ischial portion of the bone, including the greater and lesser sciatic notch, the posterior wall of the acetabulum, the majority of the quadrilateral surface, and the ischial tuberosity. The roof of the acetabulum is the thick, weightbearing portion and forms a separate fragment in bicolumnar fractures. The thin quadrilateral plate forms the medial wall or the floor of the acetabulum. Fixation of posterior wall fracture: Bone model showing the direction of screws and application of neutralization/buttress plate. Posterior wall fracture: Postoperative anteroposterior (AP) view. 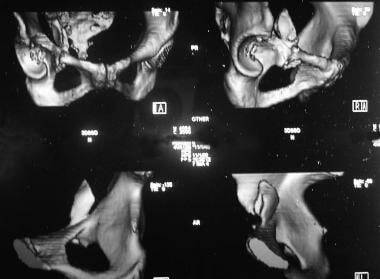 Posterior lip fracture: Postoperative iliac view. Posterior wall fracture: Postoperative obturator view. 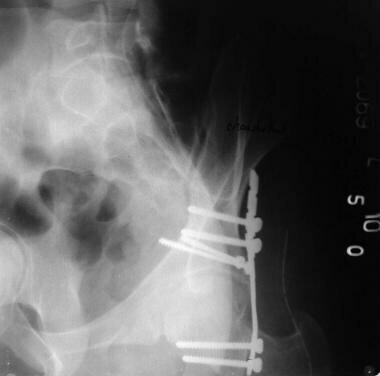 T-shaped fracture (note the use of the anterior-to-posterior lag screw to hold the posterior column). Quadrilateral surface comminution: Use of a T-plate. Use of femoral distractor during surgery. Total hip replacement in posttraumatic arthritis after an acetabular fracture. Intra-articular screw as seen on the axial cut of the CT scan. An intimate knowledge of the nerves and vessels in the area is essential to prevent iatrogenic complications at the time of surgery. Details of the relevant anatomy are elaborated further in the discussion on surgical approaches (see Treatment). Fractures of the acetabulum occur as a result of the force exerted through the head of the femur to the acetabulum. The femoral head acts like a hammer and is the last link in the chain of forces transmitted from the greater trochanter, knee, or foot to the acetabulum. The position of the femur at the time of impact and the direction of the force determine the type and displacement of the fracture. Although it is difficult to pinpoint the exact relation between the point of impact and the mechanism of injury in acetabulum fractures, certain relations are well recognized. These can help in understanding the forces involved in creating the fracture, the direction of displacement, and the fracture patterns involved. The point of impact of the femoral head is decided by the degrees of adduction and abduction and rotation of the femur. 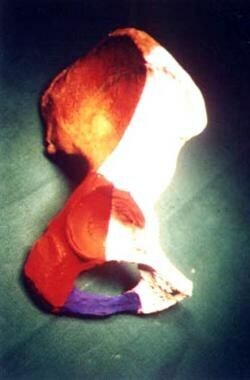 Acetabulum fracture morphology depends on the degrees of flexion or extension and adduction or abduction. The degree of hip rotation generally does not contribute significantly to the fracture pattern. A force applied to the lumbosacral region is a rare cause of acetabular fractures. In actuality, however, it is very difficult to pinpoint the exact site of impact and the mechanism of injury. These mechanisms are important, in that they help in understanding the acting forces, the direction of displacement, and the fracture patterns involved. Posterior-wall fractures (see the images below) typically involve the rim of the acetabulum, a portion of the retroacetabular surface, and a variable segment of the articular cartilage. The articular cartilage may also be impacted. Impacted articular cartilage should be diagnosed preoperatively on computed tomography (CT); these impacted fragments require elevation at the time of surgery. Posterior wall fracture with a posterior dislocation of the hip. Posterior wall fracture preoperative obturator view. Three-dimensional (3-D) CT scan showing a posterior wall fracture. Extended posterior-wall fractures can involve the entire retroacetabular surface and include a portion of the greater or lesser sciatic notch, the ischial tuberosity, or both. The ilioischial line, however, remains intact on the anteroposterior (AP) view. Posteriocolumn fractures include only the ischial portion of the bone. The entire retroacetabular surface is displaced with the posterior column. As the vertical line separating the anterior column from the posterior column traverses inferiorly, it most commonly enters the obturator foramen. 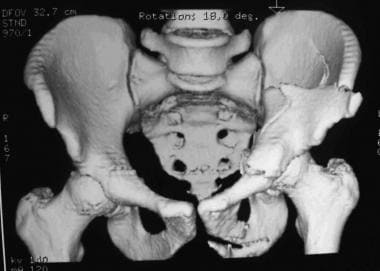 An associated fracture of the inferior pubic ramus is present. Sometimes, the fracture line traverses just posterior to the obturator foramen, splitting the ischial tuberosity. The ilioischial line typically is displaced and disassociated from the teardrop. 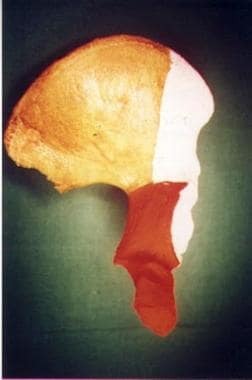 However, when a large portion of the quadrilateral surface remains intact with the posterior column, the teardrop and a portion of the pelvic brim displace with the posterior column. Anterior-wall fractures (see the images below) are uncommon injuries and often occur in conjunction with anterior dislocations. Anterior wall fracture: Three-dimensional reconstruction. Low anterior-column fractures involve only the superior ramus and pubic portion of the acetabulum. High anterior-column fractures can involve the entire anterior border of the innominate bone. The pelvic brim and iliopectineal line are displaced. Medial translation of the entire roof or a portion of the roof is typical of displacement of a high or intermediate anterior-column fracture. Transverse fractures (see the image below) divide the innominate bone into two portions. 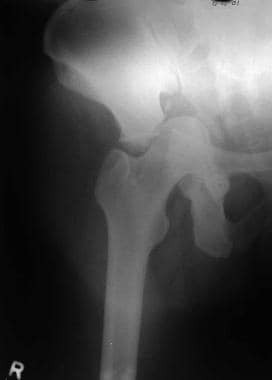 A horizontally displaced fracture line crosses the acetabulum at a variable level. The innominate bone is then divided into a superior part and a lower part. The superior part is composed of the iliac wing and a portion of the roof of the acetabulum. The lower part of the bone, the ischiopubic segment, is composed of an intact obturator foramen with the anterior and posterior walls of the acetabulum. Anterior with posterior hemitransverse fractures combine an anterior-wall or anterior-column fracture with a horizontal transverse component, which traverses the posterior column at a low level. The distinction between the associated anterior-column and associated posterior hemitransverse and T-shaped patterns is often subtle. In the anterior plus posterior hemitransverse fracture, the anterior component typically is at a higher level and is more displaced than the posterior component. The posterior-column with posterior-wall pattern (see the images below) divides the posterior column into a larger posterior-column component and an associated posterior-wall component. The ilioischial line typically is displaced and disassociated from the teardrop. Posterior lip with posterior column injury, anteroposterior view. Posterior wall with posterior column fracture, 3-D reconstruction. The transverse with posterior-wall pattern (see the image below) combines a normal transverse configuration with one or more separate posterior-wall fragments. 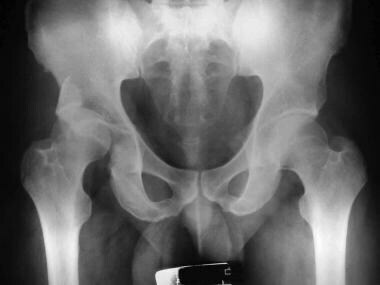 A fracture of the inferior pubic ramus typically is not seen. Transverse with posterior lip fracture. 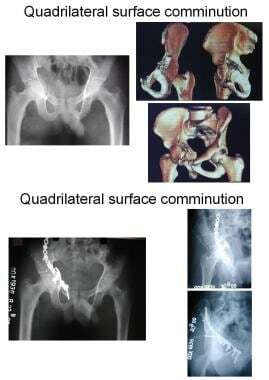 A T-shaped fracture (see the images below) is similar to a transverse fracture except for the addition of a vertical split along the quadrilateral surface and acetabular fossa (the stem of the T), which divides the anterior column from the posterior column. 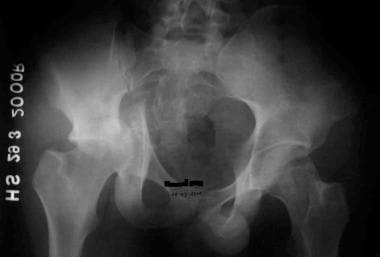 An associated fracture of the inferior pubic ramus typically is present. T-shaped fracture (break in the margins of the obturator foramen). In both-column fractures (see the images below), the anterior and posterior columns are separated from each other, and all articular segments are detached from the intact portion of the posterior ilium, which remains attached to the sacrum. A fracture of both columns is associated with the spur sign, in which the fractured edge of the intact posterior iliac wing is seen prominently relative to the medially displaced articular segments on the obturator oblique radiographic view. This sign is pathognomonic of an injury to both columns. Both-column fracture, 3-D reconstruction, anteroposterior view. 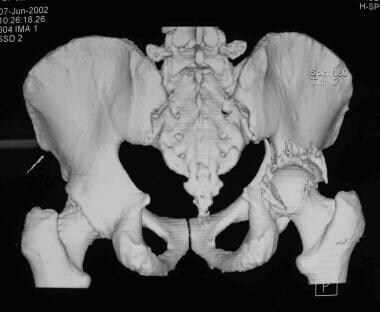 Both-column fracture, 3-D reconstruction, iliac view. Both-column fracture, 3-D reconstruction, obturator view. The Arbeitsgemeinschaft fur osteosynthesefragen–Association for the Study of Internal Fixation (AO-ASIF) classification. Each of these main types is further divided into various groups. Type C is divided into three groups: (1) high anterior-column fracture (exiting along iliac crest), (2) low anterior-column fracture (exiting below ASIS), and (3) fracture involving the sacroiliac joint. More detailed descriptions of these fractures may be achieved by using one or more "universal modifiers," which may be appended to the fracture code. Further information on the current AO/OTA classification is available on the AOTrauma Web site. Pediatric acetabular fractures are important, in that the triradiate cartilage remains open until the age of approximately 12 years. Therefore, if the acetabulum is injured before its closure, growth arrest may result, leading to a shallow acetabulum and progressive subluxation of the hip. Conversely, in patients older than 12 years, the chance of significant growth disturbance is minimal. Dora et al monitored 10 patients with posttraumatic acetabular dysplasia and reported that all 10 patients demonstrated marked retroversion averaging 27°, whereas the contralateral acetabuli showed 23° of anteversion; the average center-edge angle was 9.5°. The hip joint typically was in a lateral and caudal position, and a significant posterolateral deficiency was present. The exact incidence of acetabular fractures in various parts of the world is not known. Studies at level I trauma centers have shown an admission rate for pelvic and acetabular fractures of 0.5-7.5% (see Table 1 below). Once symptomatic posttraumatic arthritis has developed, options for salvage generally are limited to total hip arthroplasty and arthrodesis. Hadley NA, Brown TD, Weinstein SL. The effects of contact pressure elevations and aseptic necrosis on the long-term outcome of congenital hip dislocation. J Orthop Res. 1990 Jul. 8 (4):504-13. [Medline]. JUDET R, JUDET J, LETOURNEL E. FRACTURES OF THE ACETABULUM: CLASSIFICATION AND SURGICAL APPROACHES FOR OPEN REDUCTION. PRELIMINARY REPORT. J Bone Joint Surg Am. 1964 Dec. 46:1615-46. [Medline]. Letournel E, Judet R. Fractures of the Acetabulum. 2nd ed. New York: Springer-Verlag; 1993. Letournel E. Acetabulum fractures: classification and management. Clin Orthop Relat Res. 1980 Sep. (151):81-106. [Medline]. Milenković S, Saveski J, Radenković M, Vidić G, Trajkovska N. Surgical treatment of displaced acetabular fractures. Srp Arh Celok Lek. 2011 Jul-Aug. 139 (7-8):496-500. [Medline]. Thacker M. Post-operative management of acetabular fractures. Indian J Orthop. 2002. 36 (1):29-30. Kellam JF, Meinberg EG, Agel J, Karam MD, Roberts CS. Introduction: Fracture and Dislocation Classification Compendium-2018: International Comprehensive Classification of Fractures and Dislocations Committee. J Orthop Trauma. 2018 Jan. 32 Suppl 1:S1-S10. [Medline]. Heeg M, Visser JD, Oostvogel HJ. Injuries of the acetabular triradiate cartilage and sacroiliac joint. J Bone Joint Surg Br. 1988 Jan. 70 (1):34-7. [Medline]. Bucholz RW, Ezaki M, Ogden JA. Injury to the acetabular triradiate physeal cartilage. J Bone Joint Surg Am. 1982 Apr. 64 (4):600-9. [Medline]. 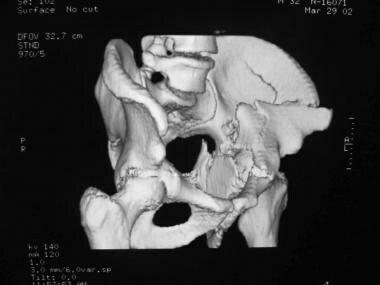 Dora C, Zurbach J, Hersche O, Ganz R. Pathomorphologic characteristics of posttraumatic acetabular dysplasia. J Orthop Trauma. 2000 Sep-Oct. 14 (7):483-9. [Medline]. Matta JM. Fractures of the acetabulum: accuracy of reduction and clinical results in patients managed operatively within three weeks after the injury. J Bone Joint Surg Am. 1996 Nov. 78 (11):1632-45. [Medline]. Dakin GJ, Eberhardt AW, Alonso JE, Stannard JP, Mann KA. Acetabular fracture patterns: associations with motor vehicle crash information. J Trauma. 1999 Dec. 47 (6):1063-71. [Medline]. Reed MH. 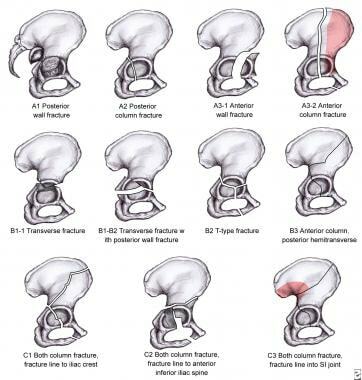 Pelvic fractures in children. J Can Assoc Radiol. 1976 Dec. 27 (4):255-61. [Medline]. Shim VB, Böshme J, Vaitl P, Josten C, Anderson IA. An efficient and accurate prediction of the stability of percutaneous fixation of acetabular fractures with finite element simulation. J Biomech Eng. 2011 Sep. 133 (9):094501. [Medline]. Wright R, Barrett K, Christie MJ, Johnson KD. Acetabular fractures: long-term follow-up of open reduction and internal fixation. J Orthop Trauma. 1994 Oct. 8 (5):397-403. [Medline]. Mayo KA. Open reduction and internal fixation of fractures of the acetabulum. Results in 163 fractures. Clin Orthop Relat Res. 1994 Aug. (305):31-7. [Medline]. Pennal GF, Davidson J, Garside H, Plewes J. 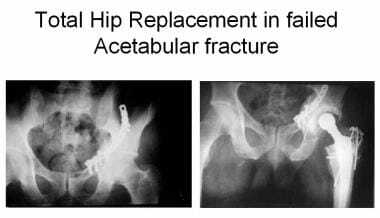 Results of treatment of acetabular fractures. Clin Orthop Relat Res. 1980 Sep. (151):115-23. [Medline]. 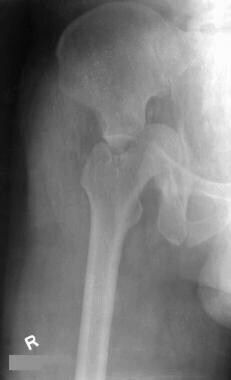 Ragnarsson B, Mjöberg B. Arthrosis after surgically treated acetabular fractures. A retrospective study of 60 cases. Acta Orthop Scand. 1992 Oct. 63 (5):511-4. [Medline]. Mears DC, Velyvis JH. Acute total hip arthroplasty for selected displaced acetabular fractures: two to twelve-year results. J Bone Joint Surg Am. 2002 Jan. 84-A (1):1-9. [Medline]. Mears DC, Velyvis JH, Chang CP. 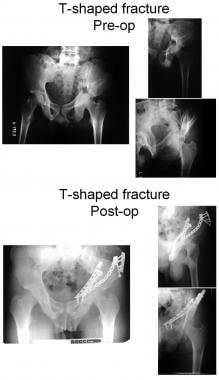 Displaced acetabular fractures managed operatively: indicators of outcome. Clin Orthop. 2003 Feb. 173-86. [Medline]. Porter SE, Schroeder AC, Dzugan SS, Graves ML, Zhang L, Russell GV. Acetabular fracture patterns and their associated injuries. J Orthop Trauma. 2008 Mar. 22 (3):165-70. [Medline]. Olson SA, Matta JM. The computerized tomography subchondral arc: a new method of assessing acetabular articular continuity after fracture (a preliminary report). J Orthop Trauma. 1993. 7 (5):402-13. [Medline]. Matta J. Operative indications and choice of surgical approach for fractures of the acetabulum. Tech Orthop. 1986. 1:13-22. 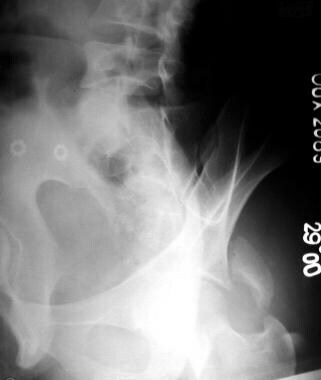 Matta JM, Anderson LM, Epstein HC, Hendricks P. Fractures of the acetabulum. A retrospective analysis. Clin Orthop Relat Res. 1986 Apr. (205):230-40. [Medline]. Øvre S, Madsen JE, Røise O. Acetabular fracture displacement, roof arc angles and 2 years outcome. Injury. 2008 Aug. 39 (8):922-31. [Medline]. Vrahas MS, Widding KK, Thomas KA. The effects of simulated transverse, anterior column, and posterior column fractures of the acetabulum on the stability of the hip joint. J Bone Joint Surg Am. 1999 Jul. 81 (7):966-74. [Medline]. Brumback RJ, Holt ES, McBride MS, Poka A, Bathon GH, Burgess AR. 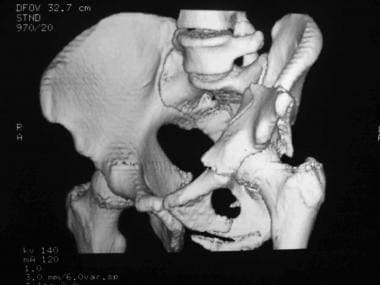 Acetabular depression fracture accompanying posterior fracture dislocation of the hip. J Orthop Trauma. 1990. 4 (1):42-8. [Medline]. Harley JD, Mack LA, Winquist RA. CT of acetabular fractures: comparison with conventional radiography. AJR Am J Roentgenol. 1982 Mar. 138 (3):413-7. [Medline]. Tile M. Fractures of the Pelvis and Acetabulum. Baltimore: Lippincott Williams & Wilkins; 1984. Borrelli J Jr, Peelle M, McFarland E, Evanoff B, Ricci WM. Computer-reconstructed radiographs are as good as plain radiographs for assessment of acetabular fractures. Am J Orthop (Belle Mead NJ). 2008 Sep. 37 (9):455-9; discussion 460. [Medline]. Li BF, Zhang Y, Tai GL, Dai YY, Xie HB, Guo XZ, et al. [Application of 3D digital orthopedic techniques in treatment of acetabular fracture]. Nan Fang Yi Ke Da Xue Xue Bao. 2016 Jun 20. 36 (7):1014-7. [Medline]. Matta JM, Mehne DK, Roffi R. Fractures of the acetabulum. Early results of a prospective study. Clin Orthop Relat Res. 1986 Apr. (205):241-50. [Medline]. Olson SA, Bay BK, Chapman MW, Sharkey NA. Biomechanical consequences of fracture and repair of the posterior wall of the acetabulum. J Bone Joint Surg Am. 1995 Aug. 77 (8):1184-92. [Medline]. Brown GA, Firoozbakhsh K, Gehlert RJ. Three-dimensional CT modeling versus traditional radiology techniques in treatment of acetabular fractures. Iowa Orthop J. 2001. 21:20-4. [Medline]. Citak M, Gardner MJ, Kendoff D, Tarte S, Krettek C, Nolte LP, et al. Virtual 3D planning of acetabular fracture reduction. J Orthop Res. 2008 Apr. 26 (4):547-52. [Medline]. Johnson EE, Kay RM, Dorey FJ. 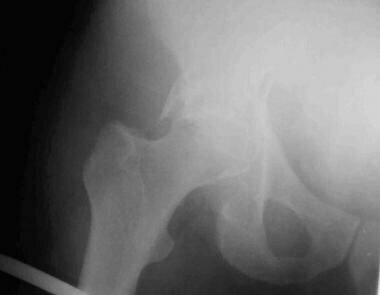 Heterotopic ossification prophylaxis following operative treatment of acetabular fracture. Clin Orthop Relat Res. 1994 Aug. (305):88-95. [Medline]. Dailey SK, Archdeacon MT. Open reduction and internal fixation of acetabulum fractures: does timing of surgery affect blood loss and OR time?. J Orthop Trauma. 2014 Sep. 28 (9):497-501. [Medline]. Mears DC, Rubash HE. Extensile exposure of the pelvis. Contemp Orthop. 1983. 6:21. Mears DC. 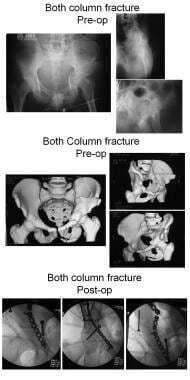 Pelvic and Acetabular Fractures. Thorofare, NJ: Slack Inc; 1986. Dean DB, Moed BR. Late salvage of failed open reduction and internal fixation of posterior wall fractures of the acetabulum. J Orthop Trauma. 2009 Mar. 23 (3):180-5. [Medline]. Isaacson MJ, Taylor BC, French BG, Poka A. Treatment of acetabulum fractures through the modified Stoppa approach: strategies and outcomes. Clin Orthop Relat Res. 2014 Nov. 472 (11):3345-52. [Medline]. [Full Text]. Bastian JD, Savic M, Cullmann JL, Zech WD, Djonov V, Keel MJ. Surgical exposures and options for instrumentation in acetabular fracture fixation: Pararectus approach versus the modified Stoppa. Injury. 2016 Mar. 47 (3):695-701. [Medline]. Bartlett CS, DiFelice GS, Buly RL, Quinn TJ, Green DS, Helfet DL. Cardiac arrest as a result of intraabdominal extravasation of fluid during arthroscopic removal of a loose body from the hip joint of a patient with an acetabular fracture. J Orthop Trauma. 1998 May. 12 (4):294-9. [Medline]. Ebraheim NA, Patil V, Liu J, Haman SP. 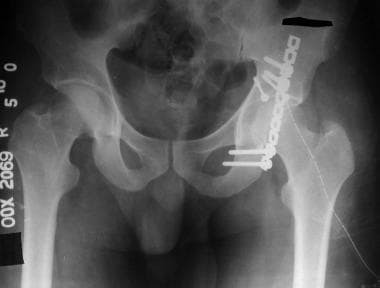 Sliding trochanteric osteotomy in acetabular fractures: a review of 30 cases. Injury. 2007 Oct. 38 (10):1177-82. [Medline]. Rollmann MF, Holstein JH, Pohlemann T, Herath SC, Histing T, Braun BJ, et al. Predictors for secondary hip osteoarthritis after acetabular fractures-a pelvic registry study. Int Orthop. 2018 Sep 29. [Medline]. Collinge C, Archdeacon M, Sagi HC. Quality of radiographic reduction and perioperative complications for transverse acetabular fractures treated by the Kocher-Langenbeck approach: prone versus lateral position. J Orthop Trauma. 2011 Sep. 25 (9):538-42. [Medline]. Helfet DL, Schmeling GJ. Management of complex acetabular fractures through single nonextensile exposures. Clin Orthop Relat Res. 1994 Aug. (305):58-68. [Medline]. Routt ML Jr, Swiontkowski MF. 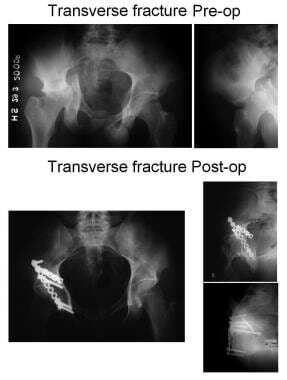 Operative treatment of complex acetabular fractures. Combined anterior and posterior exposures during the same procedure. J Bone Joint Surg Am. 1990 Jul. 72 (6):897-904. [Medline]. Schmidt CC, Gruen GS. 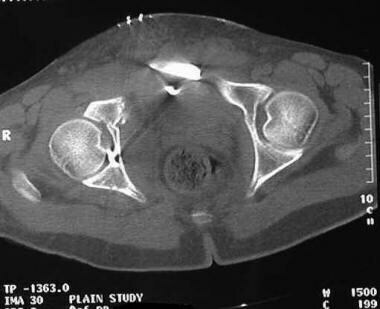 Non-extensile surgical approaches for two-column acetabular fractures. J Bone Joint Surg Br. 1993 Jul. 75 (4):556-61. [Medline]. Harris AM, Althausen P, Kellam JF, Bosse MJ. Simultaneous anterior and posterior approaches for complex acetabular fractures. J Orthop Trauma. 2008 Aug. 22 (7):494-7. [Medline]. Bosse MJ, Poka A, Reinert CM, Brumback RJ, Bathon H, Burgess AR. Preoperative angiographic assessment of the superior gluteal artery in acetabular fractures requiring extensile surgical exposures. J Orthop Trauma. 1988. 2 (4):303-7. [Medline]. Juliano PJ, Bosse MJ, Edwards KJ. The superior gluteal artery in complex acetabular procedures. A cadaveric angiographic study. J Bone Joint Surg Am. 1994 Feb. 76 (2):244-8. [Medline]. Reinert CM, Bosse MJ, Poka A, Schacherer T, Brumback RJ, Burgess AR. A modified extensile exposure for the treatment of complex or malunited acetabular fractures. J Bone Joint Surg Am. 1988 Mar. 70 (3):329-37. [Medline]. Sledge CB, ed. Master Techniques in Orthopaedic Surgery: The Hip. New York: Raven; 1998. Ganorkar S, Thacker M, Thakkar CJ. Implant selection and placement in acetabular fractures. Indian J Orthop. 2002. 36 (1):29-30. Hsu CL, Chou YC, Li YT, Chen JE, Hung CC, Wu CC, et al. Pre-operative virtual simulation and three-dimensional printing techniques for the surgical management of acetabular fractures. Int Orthop. 2018 Aug 20. [Medline]. Mehin R, Jones B, Zhu Q, Broekhuyse H. A biomechanical study of conventional acetabular internal fracture fixation versus locking plate fixation. Can J Surg. 2009 Jun. 52 (3):221-8. [Medline]. [Full Text]. Gay SB, Sistrom C, Wang GJ, Kahler DA, Boman T, McHugh N, et al. Percutaneous screw fixation of acetabular fractures with CT guidance: preliminary results of a new technique. AJR Am J Roentgenol. 1992 Apr. 158 (4):819-22. [Medline]. 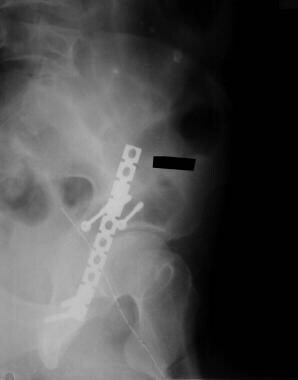 Parker PJ, Copeland C. Percutaneous fluoroscopic screw fixation of acetabular fractures. Injury. 1997 Nov-Dec. 28 (9-10):597-600. [Medline]. Starr AJ, Jones AL, Reinert CM, Borer DS. Preliminary results and complications following limited open reduction and percutaneous screw fixation of displaced fractures of the acetabulum. Injury. 2001 May. 32 Suppl 1:SA45-50. [Medline]. Starr AJ, Reinert CM, Jones AL. Percutaneous fixation of the columns of the acetabulum: a new technique. J Orthop Trauma. 1998 Jan. 12 (1):51-8. [Medline]. Li J, Li Z, Wang X, Zhang G, Peng Y, Zhang S, et al. Establishment of fluoroscopy views and standardized procedure of percutaneous magic screw insertion for acetabulum fractures. BMC Musculoskelet Disord. 2018 Sep 12. 19 (1):332. [Medline]. [Full Text]. Zhang P, Tang J, Dong Y, Lu L, Wang S, Song S, et al. A new navigational apparatus for fixation of acetabular posterior column fractures with percutaneous retrograde lagscrew: Design and application. Medicine (Baltimore). 2018 Sep. 97 (36):e12134. [Medline]. [Full Text]. Kazemi N, Archdeacon MT. Immediate full weightbearing after percutaneous fixation of anterior column acetabulum fractures. J Orthop Trauma. 2012 Feb. 26 (2):73-9. [Medline]. Mauffrey C, Hake M, Kim FJ. Flexible 3D laparoscopic assisted reduction and percutaneous fixation of acetabular fractures: Introduction to a new surgical option. Injury. 2016 Oct. 47 (10):2203-2211. [Medline]. Weber M, Berry DJ, Harmsen WS. Total hip arthroplasty after operative treatment of an acetabular fracture. J Bone Joint Surg Am. 1998 Sep. 80 (9):1295-305. [Medline]. Bellabarba C, Berger RA, Bentley CD, Quigley LR, Jacobs JJ, Rosenberg AG, et al. Cementless acetabular reconstruction after acetabular fracture. J Bone Joint Surg Am. 2001 Jun. 83-A (6):868-76. [Medline]. Boraiah S, Ragsdale M, Achor T, Zelicof S, Asprinio DE. Open reduction internal fixation and primary total hip arthroplasty of selected acetabular fractures. J Orthop Trauma. 2009 Apr. 23 (4):243-8. [Medline]. Haidukewych GJ, Scaduto J, Herscovici D Jr, Sanders RW, DiPasquale T. Iatrogenic nerve injury in acetabular fracture surgery: a comparison of monitored and unmonitored procedures. J Orthop Trauma. 2002 May. 16 (5):297-301. [Medline]. Helfet DL, Anand N, Malkani AL, Heise C, Quinn TJ, Green DS, et al. Intraoperative monitoring of motor pathways during operative fixation of acute acetabular fractures. J Orthop Trauma. 1997 Jan. 11 (1):2-6. [Medline]. Middlebrooks ES, Sims SH, Kellam JF, Bosse MJ. Incidence of sciatic nerve injury in operatively treated acetabular fractures without somatosensory evoked potential monitoring. J Orthop Trauma. 1997 Jul. 11 (5):327-9. [Medline]. Johnson EE, Eckardt JJ, Letournel E. Extrinsic femoral artery occlusion following internal fixation of an acetabular fracture. A case report. Clin Orthop Relat Res. 1987 Apr. (217):209-13. [Medline]. Probe R, Reeve R, Lindsey RW. Femoral artery thrombosis after open reduction of an acetabular fracture. Clin Orthop Relat Res. 1992 Oct. (283):258-60. [Medline]. Burd TA, Lowry KJ, Anglen JO. Indomethacin compared with localized irradiation for the prevention of heterotopic ossification following surgical treatment of acetabular fractures. J Bone Joint Surg Am. 2001 Dec. 83-A (12):1783-8. [Medline]. Kendoff D, Gardner MJ, Citak M, Kfuri M Jr, Thumes B, Krettek C, et al. Value of 3D fluoroscopic imaging of acetabular fractures comparison to 2D fluoroscopy and CT imaging. Arch Orthop Trauma Surg. 2008 Jun. 128 (6):599-605. [Medline]. Maini L, Kumar S, Batra S, Gupta R, Arora S. Evaluation of the muscle morphology of the obturator externus and piriformis as the predictors of avascular necrosis of the femoral head in acetabular fractures. Strategies Trauma Limb Reconstr. 2016 Aug. 11 (2):105-11. [Medline]. Moed BR, Karges DE. Prophylactic indomethacin for the prevention of heterotopic ossification after acetabular fracture surgery in high-risk patients. J Orthop Trauma. 1994. 8 (1):34-9. [Medline]. Johnson EE, Matta JM, Mast JW, Letournel E. Delayed reconstruction of acetabular fractures 21-120 days following injury. Clin Orthop Relat Res. 1994 Aug. (305):20-30. [Medline]. Bilateral acetabular fractures with posterior dislocations. 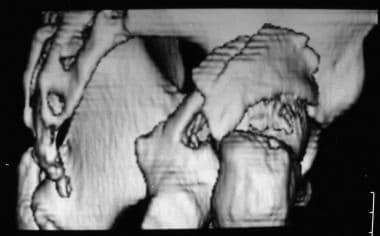 Incarcerated fragment best seen on axial cuts of the CT scan. Transverse fracture, iliac view. Also note the impaction fracture on the femoral head. Incision for the Kocher-Langenbeck approach. 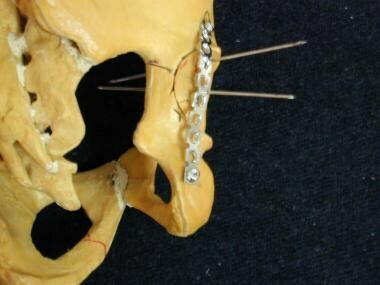 Trochanteric osteotomy to increase the exposure during a Kocher-Langenbeck approach. Ilioinguinal approach: Anterior column plate.